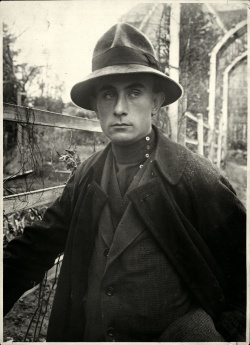 Lajos Kassák (1887–1967) was a Hungarian poet, novelist, painter, essayist, editor, and theoretician of the avant-garde. Based on the panel at permanent exhibition in the Kassák Museum, Budapest; there compiled from biographical text by Ferenc Csaplár. 1887: Born in Érsekújvár, Austria-Hungary. 1900: Leaves school for apprenticeship as locksmith. 1904: Moves to Budapest and starts working in factories in Angyalföld and Újpest. Participates in trades union political campaigns and joins Hungarian Social Democratic Party. 1908: First poem published in the weekly Újpest. 1909: Sets out for Western Europe on foot, with no money. Discovers art in the museums. Returns to Budapest in December. 1915: Founds anti-militarist periodical A Tett [The Action]. 1916: The international issue of A Tett appears with contributions from writers and artists from countries at war with the monarchy, and the periodical is banned. Launches a new periodical MA [Today]. 1919: During Hungarian Soviet Republic enters into dispute with Commissar Bela Kun over avant-garde art and the independence of art from politics. MA subsequently prevented from appearing. After the failure of the Soviet Republic spends five months in prison. 1920: After his release, leaves the country for exile in Vienna. Relaunches MA, formulates the theoretical basis of Hungarian constructivism and develops wide contacts with European avant-garde movements. 1926: Returns to Hungary and starts up new journal, Dokumentum [Document] which lasts for one year. 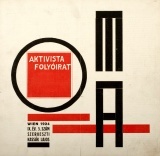 1928: Launches a new, independent, left-wing journal Munka [Work] and associated movement. 1928-34: Leader of a socially-aware educational society of students and workers, grouped around Munka. Writes regularly for the newspapers Népszava [People's Voice] and Szocializmus [Socialism], protesting against Stalinist tyranny and extreme right-wing movements. 1939: Exhibits in the Galerie Charpentier, Paris. A new law restricting press freedom closes down Munka. 1940-45: Publishes several novels, books of reports and books of verse. In 1940, an anti-war poem causes him to be imprisoned for two months under a 1937 court judgement. 1945: After the war takes on several positions in cultural affairs in the new political climate. Edits the relaunched Új Idők [New Times] and then the Alkotás [Art] and Kortárs [The Contemporary]. 1948: His journals are closed down, he is excluded from public affairs, and his poems and articles cannot be published. 1956: Stands up for the Revolution, returns to artistic affairs. 1957: Public involvement limited, but his old writing begins to be republished. 1960: Exhibition of his work in the Galerie Denise René in Paris, resumption of his international career. Still ignored as an artist in Hungary. 1965: Awarded Kossuth Prize for his poetry. 1967: Holds the last exhibition in his life in the Adolf Fényes Room in Budapest, at his own expense. Volkstümliche Motive, c1921. Gouache on paper. Cover of Buch Neuer Künstler, Vienna, 1922. Bildarchitektur. Silkscreen on thin cardboard. Bildarchitektur II (Entwurf eines Kiosks), 1922. Gouache, cardboard. Bildarchitektur [Kiosk], 1923. Gouache, ink, paper. Tó Mozi [Tó Kino], 1928. Photo by Lajos Lengyel, 1930.
editor, A Tett, 17 numbers, 1915-16.
editor, MA, 76 numbers, Budapest (1916-19) and Vienna (1919-25), 1916-25.
editor, Akasztott Ember, 5 numbers, Vienna, 1922-23.
editor, Dokumentum, 5 numbers, Budapest, 1926-27.
editor, Munka, 65 numbers, Budapest, 1928-39. The Kassák Museum and the Kassák Foundation, Budapest. Biography on the website of the Kassák Museum. This page was last modified on 25 September 2017, at 15:24. This page has been accessed 16,544 times.